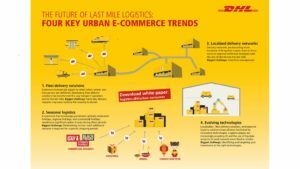 Urbanization is making the last mile of delivery more complex and critical for the success of e-commerce companies, according to new research by DHL. With over 600 million more people forecast to live in urban environments by 2030 and new technologies creating opportunities for both service enhancement and disruption, online retailers and their logistics partners are being challenged to embrace bold new approaches in order to survive and compete. 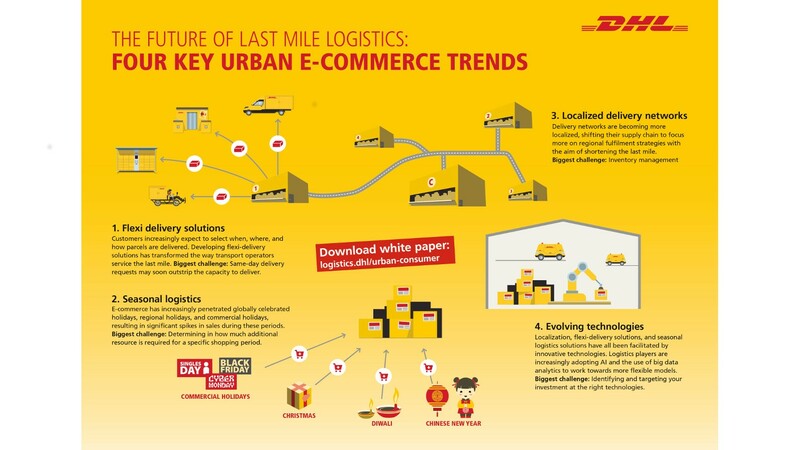 In the white paper, Shortening the Last Mile: Winning Logistics Strategies in the Race to the Urban Consumer, DHL, and Euromonitor have identified the four main trends that are shaping urban last mile transportation – localized delivery, flexi-delivery networks, seasonal logistics and evolving technologies – and ways in which companies can adapt their supply chains to the changing market environment and achieve competitive advantage. The white paper found that the major urban trends all create various challenges in terms of cost, service impact and organizational strain. For example, the growth of seasonal logistics as a result of increasingly popular holidays and promotional days such as Asia’s Singles’ Day or national Cyber Days, places significant pressure on logistics companies to build up additional capacity and hire resources to cope with short-term volume surges, which can in turn be difficult to predict. Urban customers’ demands for speed and convenience are forcing retailers to overhaul their warehousing networks, replacing centralized networks with local fulfilment and distribution infrastructure, which can require a more accurate balancing of inventory. Evolving technologies are creating opportunities for new disruptive challengers to enter the market, while also requiring incumbents to invest prudently and incorporate new skills into their workforce. To overcome these challenges, DHL and Euromonitor have jointly identified the F.A.D. (Flexible transport networks, Automation and Data) model as a framework that will help retailers and logistics operators to ensure their competitiveness over the last mile. By improving their performance in increasing automation, managing data and building flexibility into their networks, e-commerce companies in all markets will be able to better manage inventory and increase the efficiency of their last-mile delivery networks. For same-day deliveries — and potentially same-hour deliveries — fundamental and conceptual shifts to the supply chain are being considered. Crowdsourced deliveries, or outsourcing deliveries to third parties such as Postmates and UberRUSH or Grab and Go Jek in Asia, are rising in adoption, according to DHL. Creating a more elastic framework that includes alternatives to standard delivery methods, whether mechanized, invented, or crowdsourced, will be critical to overcome these barriers and control these costs. This is particularly true when orders spike for compressed periods of time during the year.